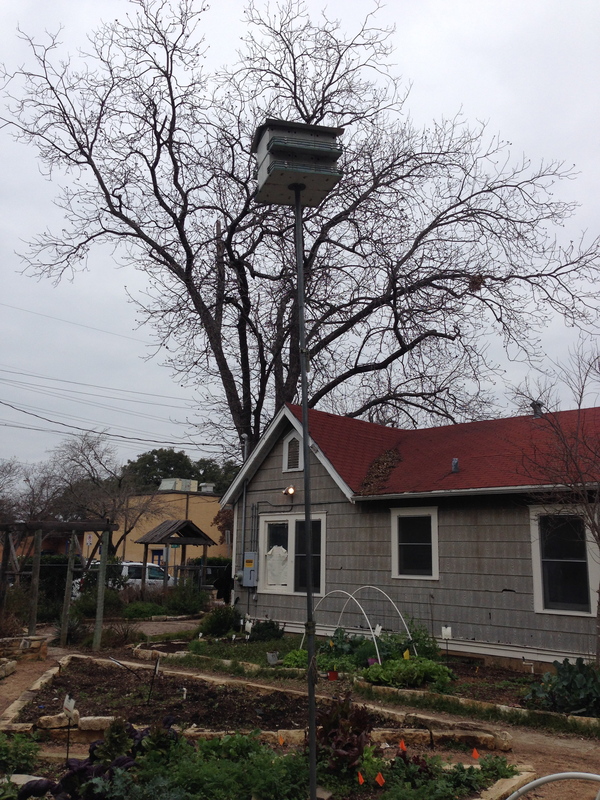 The birdhouse in our Green Classroom has been cleaned and is waiting for the arrival of this year’s migration of Purple Martins. The Purple Martin is the largest member of the swallow family in North America. The adult males are a shiny black/purple and the females and juveniles are dark with lighter undersides. They have a beautiful gurgling call that is delightful to hear. Martins have an average lifespan of 5-10 years. They have a beautiful “soaring flight pattern” and can fly from 17 to 40 miles per hour. Purple Martins live all over the United States in the warmer months (except for the Rocky Mountain area). East of the Rocky Mountains, they are totally dependent on man for their nesting sites. Martins live in permanent family units. 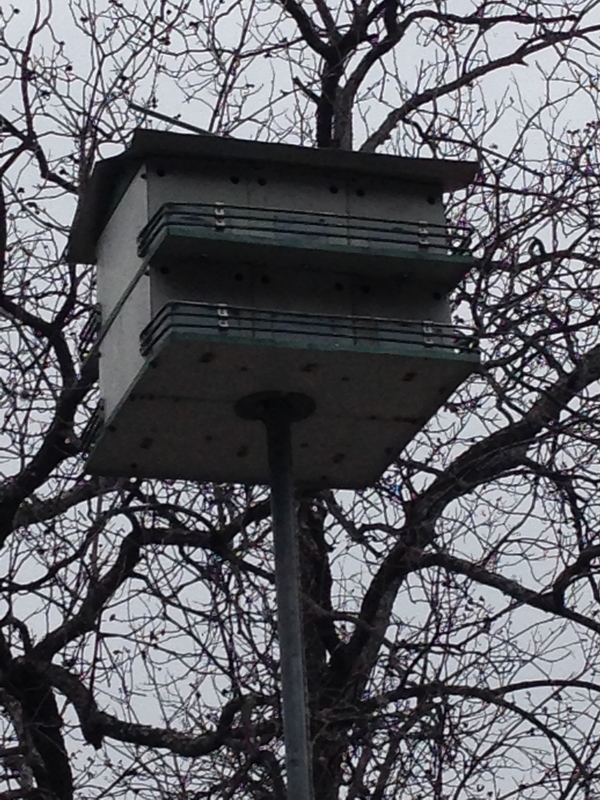 They will not nest in trees or on the ground but will live in houses that we provide. We will need to respect their house and not touch the pole. They are semi-tropical birds and in late summer they will leave Texas and begin their long flight to Brazil, Argentina and surrounding area’s. There are three primary flight paths; Baja-through eastern Mexico, Louisiana– over the Gulf of Mexico, and the Florida Key’s– which is through Florida and the eastern Gulf. Our birds follow the Baja flightpath. Soon after they have arrived and begin to nest, they will lay their eggs and their babies will be born here. It’s great fun to see them venturing out of the nest and taking their first try at flying. Generally, the first “scouts” will arrive in Central Texas around Valentine’s Day. These are the “Second Year Adults” who have been in the selected area before. Shortly after the scouts, the rest of the birds will arrive. It is true that once you have a colony in a house…many of the same birds will return the next year. Purple Martins eat flying insects. They will not eat from feeders or birdbaths. They prefer flies, moths, grasshoppers, mosquitos and dragonflies. They are very tolerant of human beings but do not like to nest near tree’s or other high structures. Starlings, owls and English sparrows are predators and will try to damage the eggs in a nest. We are waiting to see if any “scouts “ show up. We will first see them sitting on the house. If they choose to live in our Green Classroom, then we will open up the holes for the rest of the colony. Sometimes you do not get Martins in your house. They may not feel “safe” where your house is or they may determine that there are too many predators for their babies. We’ll have to just wait to see if we have Purple Martins that are eager to become Becker Bobcats!